Sometimes kids need to get a little destructive and tearing paper is a controlled way to get out pent up energy and practice fine motor skills! Here are a couple ideas for creating torn paper crafts using scrap paper and glue ~ no scissors required! For this craft you will tear strips of paper and create a portrait. 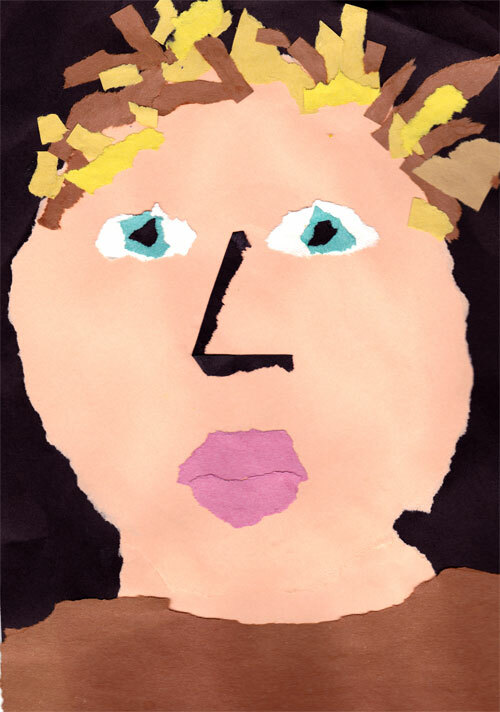 Kids can create a self portrait or make the face of their favorite character! 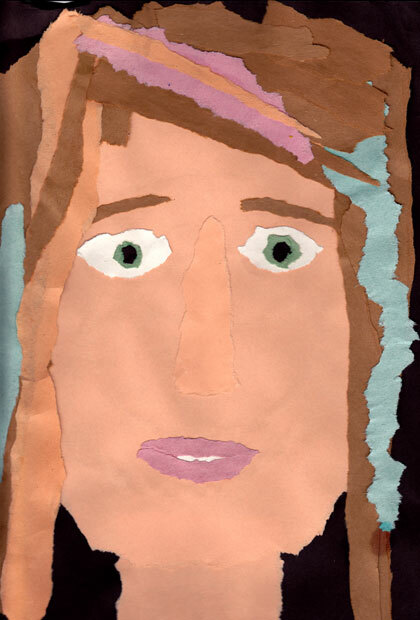 Start by tearing skin colored construction paper into an oval to create the shape of a face. Tear some construction paper into a rectangle for the neck and glue it onto the back of the face. Glue the neck and the face onto a piece of black construction paper. Tear scrap construction paper into a rectangle for the shirt and glue it into place. Use scrap paper to make the eyes, hair, nose, mouth, and any accessories that you want to add. Tear paper into strips to create a beautiful landscape for the background of a portrait or on its own! Below is an example of a colorful landscape you can make out of torn construction paper. Before you begin, decide on what kind of landscape you will be to creating. Do you prefer a desert or mountain landscape? Maybe you have an idea for something else. What time of day will it be in your picture? Will you add trees or bodies of water? Next, decide what colors you will be using. You can even use pictures from a magazine as inspiration. Now your ready to begin! 1. Choose a color for the sky in your picture. Place this piece in front of you. This piece will be the background that you glue all the other pieces to. 2. Begin by tearing a strip of paper for the top part of your landscape. Tear it so it is the same width as the background. Position it a couple of inches from the top, leaving enough room for the sky. Don’t glue anything down yet! 3. Continue to tear and arrange pieces of construction paper until you are done adding the mountains, plains, and hills. 5. Adjust and arrange the construction paper until it is the way you want it. 6. Glue each torn strip to the background piece, starting with the highest paper strip and working your way down. Tuck in the sun or moon behind the top piece and glue it down to complete your beautiful picture! I hope you enjoyed these craftivities! Let me know what you think in the comment section below!